An unusual katydid turned up at home this week, a species we had not encountered before. We suspected it was a member of the genus Austrosalomona as we are familiar with several local species, and this specimen shares many traits with them. 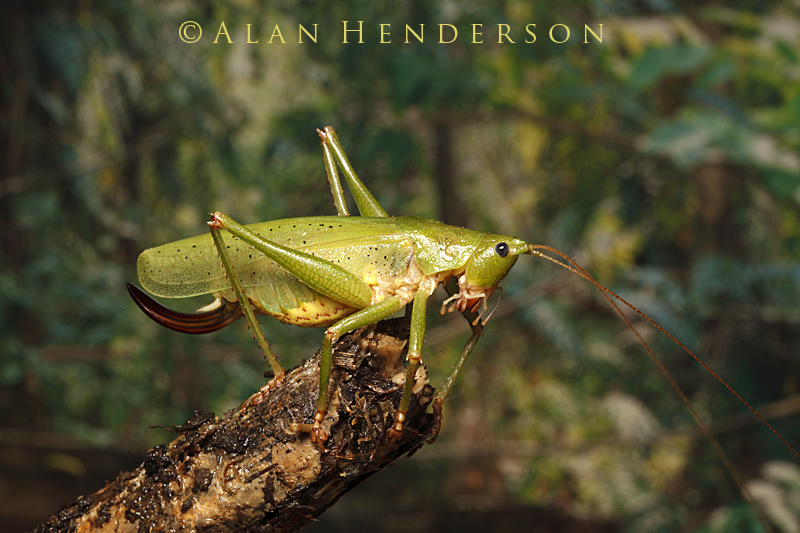 Naturally we referred the identification to katydid guru David Rentz, author of ‘A Guide to the Katydids of Australia’. It turns out that even David may not be familiar with this one, but he thinks that it may be an Austrosalomona. These encounters make living in the wet tropics very exciting for us ‘bug nuts’. There are so many species up here, you never know what you are going to find. We have determined that the species is at least partly predatory as it attacked and consumed an entire herbivorous katydid Caedicia kuranda. 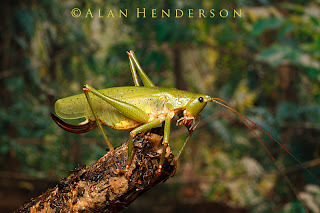 Austrosalomona katydids are generally omnivores, and will consume plant material (particularly flowers), and other invertebrates opportunistically. We intend to house the katydid in a terrarium for a while to learn a little more about the species. As it is an adult female, there is a good chance that she may lay eggs. 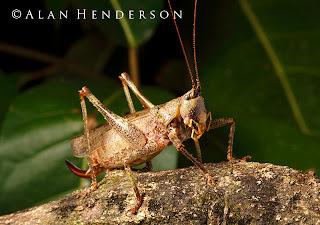 The surprise visitor - an adult female (note the large ovipositor at the rear of the katydid). Austrosalomona 'destructor' - the most common member of this genus in the Kuranda area.